A popular choice for eternity and engagement rings, the sublime amethyst rings here at Diamond Boutique honour this stunning stone's rich history. Once thought to have had healing and protective powers by the ancient Eyyptians and Romans, the amethyst was one of the most highly-regarded gems. Today, as well as garnishing the fingers of many women, it also serves as a popular birthstone for children born in February. 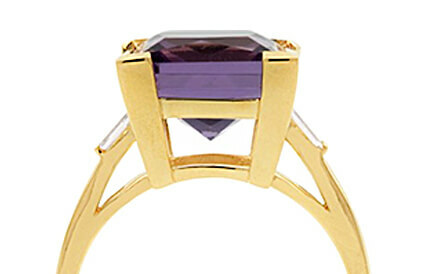 Get lost in the magical colour of the amethyst ring and peruse the range below. Many of the unique designs offer free engraving, contact us today on +44 (0) 203 6959 885 if you need any help or have a special request.